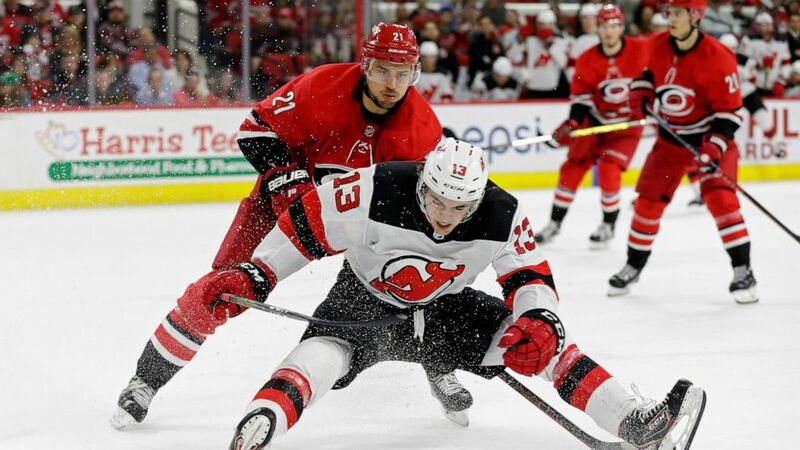 Justin Faulk scored the go-ahead goal in the second period, and the Carolina Hurricanes clinched their first playoff berth in a decade by beating the New Jersey Devils 3-1. No current Carolina Hurricanes player has skated in more games than Justin Faulk — 558 in all, and not a single one in the playoffs. The Hurricanes clinched their first postseason berth in a decade Thursday night by beating the New Jersey Devils 3-1 after Faulk scored the go-ahead goal in the second period. "It's exciting, everyone can see all the emotion out of the group and in here right now, there's still a bit of a vibe," said Faulk, with teammates whooping and clapping in the background. "It's great, and we're not happy yet, right?" he added. "We're excited, we're obviously happy, but we're not done and that's not enough just to get into the playoffs, and we know that, and that's been our mindset the whole year." Petr Mrazek made 35 saves, Warren Foegele also scored and Nino Neiderreiter added an insurance goal with 3:25 left to help the Hurricanes snap the NHL's longest active playoff drought. Now, that dubious distinction belongs to Buffalo, which will miss the postseason for the eighth straight season. The victory — coupled with Montreal's loss at Washington — wrapped up Carolina's first postseason berth since 2009 and just its second since winning the Stanley Cup in 2006. It came exactly 10 years after the Hurricanes clinched their most recent playoff berth on April 4, 2009, when they beat Pittsburgh. These Hurricanes will enter their regular-season finale with 97 points — matching that 2009 team for second-most in club history. "The goal was to get relevant. That's the first thing," said first-year coach Rod Brind'Amour, the captain of that Cup champion team 13 years ago. "I felt like we'd kind of fallen off the map, and obviously, we're not done. This isn't the final thing. We want to be the best team. But there's a step that has to be taken, and it's a huge step to make the playoffs. Can't say enough about the group — just can't." It's quite a turnaround for a team that avoided joining the Florida Panthers from 2001-11 and the Edmonton Oilers from 2007-16 as the only clubs to miss the postseason for 10 consecutive seasons. During the second period, the fans chanted "We want playoffs!" Just a few months ago, that would have been a ridiculous thought. On Dec. 30, Carolina was one point out of last place in the East with a 15-17-5 record. Since then, they've gone 31-12-2. "It's been a grind, but it's all been worth it," Foegele said. "And we're not done. We've got to continue this." Foegele livened up a tense PNC Arena crowd by scoring the tying goal with 9:57 left in the first. He slipped past behind the Devils' defensemen and Dougie Hamilton hit him with a pretty pass that set up his breakaway chance. Faulk then put the Hurricanes up with a power-play blast from the point 96 seconds into the second — helping to ensure his eighth NHL season would end in the postseason. Andy Greene put the Devils up 1-0 by taking a feed from Michael McLeod and beating Mrazek with a wrist shot from behind the circle at 4:56. Greene scored and Cory Schneider stopped 22 shots for the Devils, who have lost three of four and have clinched last place in the Metropolitan Division. "I thought we competed very hard. I thought for the majority of the game, we were the better team," coach John Hynes said. "This game was a little indicative of our team. We had work ethic. I thought we competed very well. We didn't find a way to score enough." NOTES: C Pavel Zacha had the second assist on Greene's goal, giving him five points in four games this season against Carolina. ... Williams was selected as winner of two team awards: the Steve Chiasson Award for determination as voted on by his teammates, and the Josef Vasicek Award for media cooperation as determined by the local chapter of the Professional Hockey Writers Association. The local PHWA group also voted Aho as the team's MVP. Devils: Wrap up their season Saturday night at Florida. Hurricanes: Finish the regular season Saturday night at Philadelphia.